These are great advantages as you can focus your efforts more on your Application and Database Development rather than Administration. You will still have to do things like creating databases, designing tables, building stored procedures, configuring users and other development activities on the cloud database. Still this is a BIG step in the right direction especially for small companies as there databases will be managed by Microsoft in the cloud environment. How to you setup SQL Azure server and cloud database? 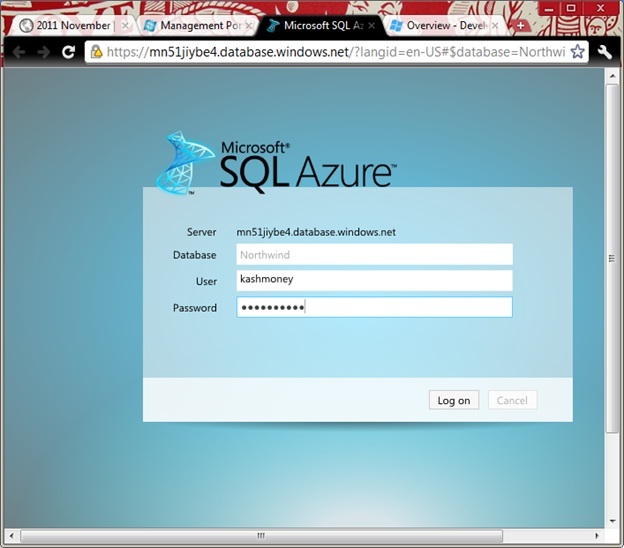 In order to get SQL azure, you have to create a Windows LIVE ID and sign up for service at Windows Azure Portal. Currently they are offering the Cloud service as a 3 month FREE SQL Azure trial. Speaking of pricing, Windows and SQL Azure use the “utility model”. You will only be billed for the amount of usage that you incur just like an electric/gas utility model. This is a new paradigm for computing as it lets you scale up or scale down as your business needs change through the project lifecycle. We have been using SQL Azure mostly for development and pay around $10/month for a High Available, Fault Tolerant database! 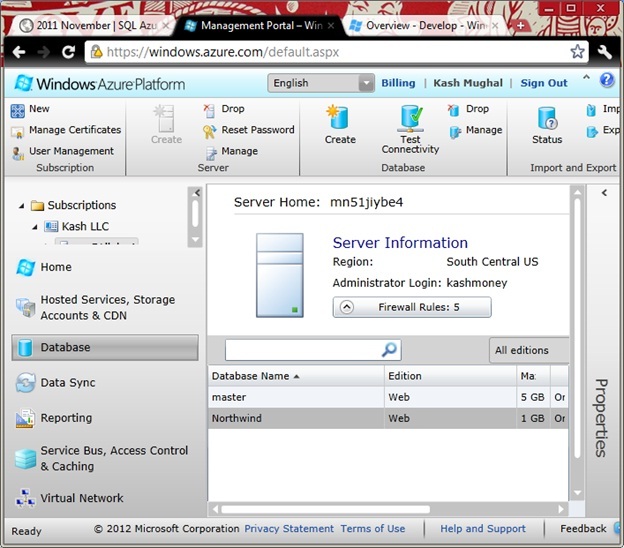 In the following screen shot, you can see that we are logged into the Windows Azure Platform. 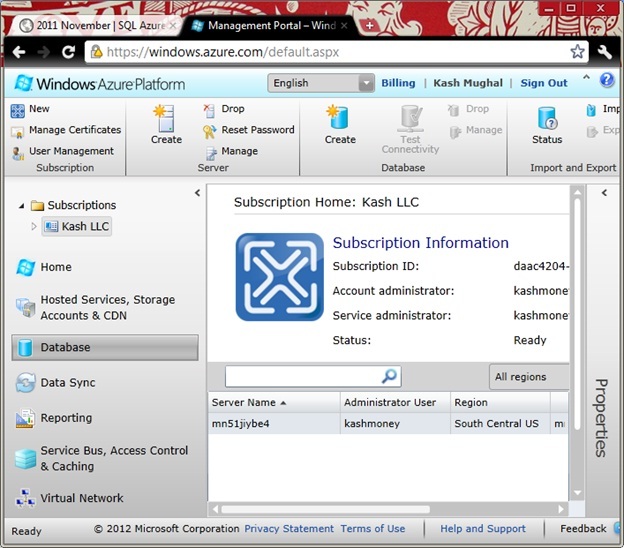 You can see that we have one subscribtion named Kash LLC. When we select the Database tab in the left Nav bar, you can see our Azure database server (mn51…) in the middle portion of the screen. Next we want to lookup our cloud databases on the this SQL Azure server. We go one level deeper and expand the Subscription node. 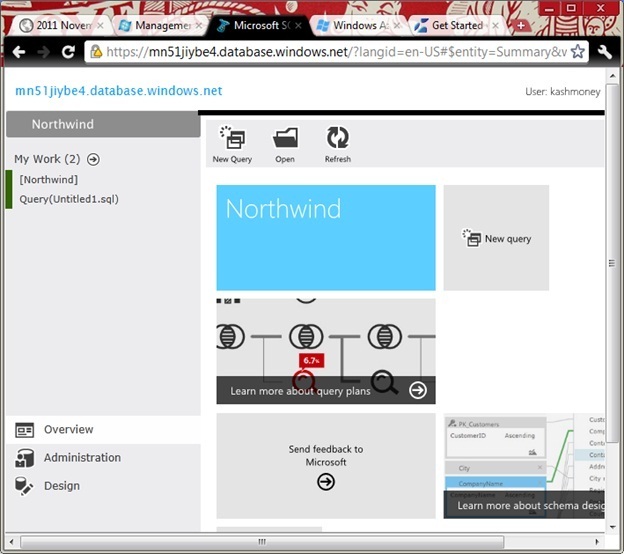 You can now see that we have two databases, Master and Northwind under our Cloud server. We select Northiwnd database, then click on Manage (Database) in the top Toolbar menu. 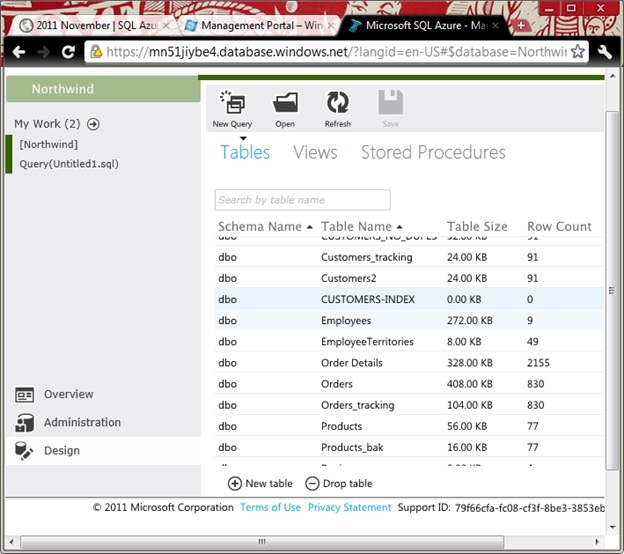 This will launch the newly designed Management Portal for SQL Azure shown below. Notice that you do have the ability to do the same thing using ssms 2008 R2. We enter our login information here and then press Log on. If you receive an error, please make sure that the Firewall is accessible to the computer you are trying to login from. This is a common issue when logging into SQL Azure. Next you should see the dashboard within the Management Portal for SQL Azure. Here is what is look like on our machine. We are going to create a new table in our Cloud database. We already have the TSQL ready for it. Just need to execute in SQL Azure. Click on New Query. 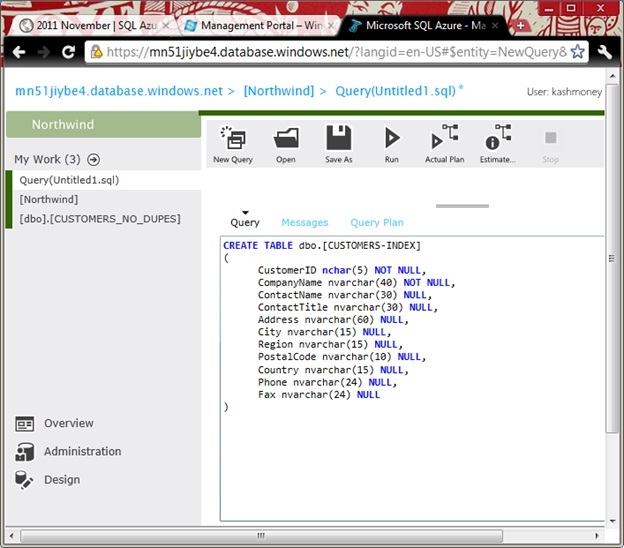 You will get a window that looks somewhat similar to SQL Server Management Studio. Go ahead and paste the SQL here. This is how it looks on our end. After you click Run from the Toolbar, this should go ahead and create the table. If you want to verify it, you can select Design option from the left menu. This will take you to the Object Browser where you can see database objects like tables, views and stored procedures. We conclude this blog post and hope you found it helpful in understanding SQL Azure and Management Portal for SQL Azure. Please visit our SQL Azure videos page for further information. This entry was posted in Cloud database, SQL Azure tutorials, TSQL, What is SQL Azure and tagged Manage SQL Azure, TSQL, What is SQL Azure. Bookmark the permalink.